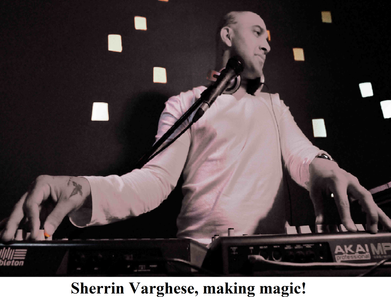 Sherrin Varghese appeared on the music scene as the effervescent Cherokee with the famed Rubber Band from the hit talk show Movers & Shakers. He wooed the audience with his pristine, melodious tones. With next to no training in music other than being part of his school choir, Sherrin was able to make the most of the opportunity to climb the ladder to musical fame. It was a time when following a typical professional career, after going through the motions of an education and examinations, was the norm. There would be no attempts made to provide guidance in following a career in the arts, in this case music. Sherrin’s father certainly found his son’s career choice strange and struggled to accept Sherrin's decision of throwing away the chance of keeping himself financially secure. After all, there were no guarantees that success would follow upon success, leading to a profitable run in the music industry. His mother and his future wife offered him their full support in his decision. As Cherokee of the Rubber Band he was highly motivated by the fan mail from his adoring audience. His voice was appreciated and this had him enthused to carry on with music. Sherrin’s actual training ground for the performer he has become today was Movers & Shakers. From 1999, for two years, he grasped every occasion to rub shoulders with the who’s who of the entertainment world. The likes of Zakir Hussain, MC Hammer, Talvin Singh, Julio Iglesias Junior, Shivamani, DJ Whosane and music maestros from all over the world have graced the show and provided Sherrin the chance to learn and grow as a musician and singer. India’s renowned musicians, singers, poets, lyricists and actors came on the show and Sherrin was required to jam with them or create an original intro and outro for them. He would have to play something spot on just on a drum count and a key yell. He says, ‘Off the top of my head I remember all the Indi-Pop acts being born in front of me and almost every growing TV actor making his point on the show.’ But host Shekhar Suman proved the best teacher of all as Sherrin observed him from close quarters, taking in the finer nuances of acting, hosting, reacting, etc. A Band of Boys was India’s answer to the Backstreet Boys and the brainchild of the MD of Clea Public relations, Mr. Vinod Nair. The hunt for the right voices went on by word of mouth. Seven hundred aspirants auditioned of which five came through to form India’s first and only boy band till date. Two years were invested in grooming and training the five, Sherrin Varghese, Karan Oberoi, Sudhanshu Pandey, Siddharth Haldipur and Chaitnya Bhosale, to make history in Indian music. The music of the band’s albums Yeh Bhi Who Bhi and Gaane Bhi Do Yaaron was composed and produced by Lesle Lewis and lyrics were by Vinod Nair a.k.a Pyaasa and Sameer respectively. The two albums were hits. Yeh Bhi Who Bhi includes one of Sherrin’s favourite songs by A Band of Boys, Gori, which was a huge success on radio. He also counts Tera Chehra from the same album as one of his favourites. He candidly states, ‘The ones which we did on our own were Kiss Kisko and Ghanta-The Bell. Mega failures according to me.’ The band continues to exist on paper with three of the band mates Chin2 (Chaitnya Bhosale), Karan and Sudhanshu, making a comeback some time ago. It has been two years since Siddharth left to pursue a career in Bollywood while Sherrin broke away last year. This enterprising personality, who is inspired by everything from God, family, the seasons, inanimate objects to social media, and has been schooled by a plethora of musicians post Beatles, has launched a solo career performing and producing live vocal electronica with organic instrumentation on all sub genres of bass music. Sherrin says, ‘I curate my own brand of Electro Pop, Complextro, Downtempo, Glitch Hop, Tech House and Deep tech. 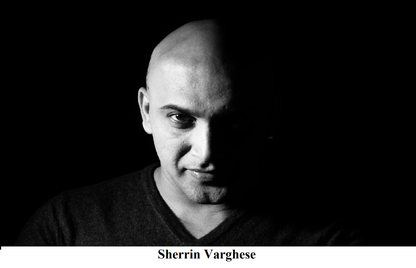 My latest act is called Sherrin Varghese and The Liquid Bass Project. We are a three piece live Electronica outfit with vocals, a synth and a guitar player.’ His album Dravidian Bass has done extremely well in the South and the number Adipoli has become a runaway hit. Besides this, Sherrin runs a studio, producing corporate anthems, jingles for ad films and TVCs (Television commercials) professionally. He has produced an album for an international artiste called Komal Kuwadekar from London with a big band sound. He has also composed and produced a song called Gheun Tak, which will be the theme and the promotional tool for a ground event in October 2014. This event is being curated by Suresh Thomas from Crescendo Music and Belliza Events with Mika Singh. On 23rd August, Sherrin along with other artistes, performed in Kochi at a charity event for India’s street heroes. This was aimed at supporting the psychological and emotional rehabilitation of children and youth at risk. Sherrin is part of the cast in Lijo Jose Peliserry's latest blockbuster movie in Mollywood called Double Barrel. Sherrin says of Peliserry, ‘He is an acclaimed director here with three back to back hits to his claim and a phenomenal director with a vision.’ The future, as Sherrin sees it, holds promise, as he embarks on an acting career and gears up to present an album in the mould of a new genre he is incorporating as his own called Bollytronica.